110V Bubble Machine Electric Big Bubble Blower Machine for Wedding and Stage Show(300047) by TECHTONGDA at IGWT. Hurry! Limited time offer. Offer valid only while supplies last. 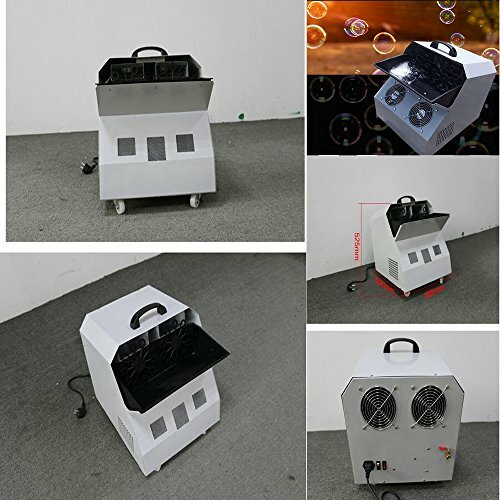 Bubble machine owns light weight metal case and durable construction It is used in outdoor/indoor for kids parties, weddings, discos and much more. It is used in outdoor/indoor for kids parties, weddings, discos and much more. It owns large, easy removable fluid tank and adjustable handle. 1.Compact design and quiet motor, easy fill reservoir and easy on/Off switch. 2.It easy to create thousands of bubbles at the touch of a button. 3.Low Maintenance. if you clean your bubble machine regularly, it will save money on maintenance. 4.Pour the bubble fluid into the chamber and flick a switch to get the show started. 5.Application:Home Party/Wedding/Birthday Party/KTV Show etc.